Background: Incorrect use of inhalers is very common and subsequently leads to poor control of COPD. Among health care providers, pharmacists are in the best position to educate patients about the correct use of inhaler devices. Objective: The objective of this study was to evaluate the impact of pharmacist-led training on the improvement of inhaler technique for COPD patients in Vietnam. Patients and methods: For this pre- and post-intervention study, standardized checklists of correct use of metered-dose inhalers (MDIs) and dry powder inhalers (DPIs) were used to evaluate the inhaler technique. A scoring system (maximum score =8) was applied before and after training to guarantee assessment uniformity among pharmacists. Three methods including “face-to-face training”, “teach-back” and “technique reminder label” were used. After the baseline evaluation (T0), the inhaler technique was reassessed after 1 month (T1), 3 months (T2), 6 months (T3) and 12 months (T4). Results: A total of 211 COPD patients participated in the study. Before the training, a high rate of errors was recorded. After the training, the percentage of patients using MDIs and DPIs perfectly increased significantly (p<0.05). The mean technique score for MDIs and DPIs improved from 6.0 (T0) to 7.5 (T3) and 6.9 (T4) and 6.7 (T0) to 7.6 (T3) and 7.2 (T4), respectively (p<0.05). The average training time was 6 minutes (T0) and 3 minutes (T3), respectively. Conclusion: Pharmacist-led comprehensive inhaler technique intervention program using an unbiased and simple scoring system can significantly improve the inhaler techniques in COPD patients. Our results indicated a 3-month period as the optimal time period between training and retraining for maintaining the correct inhaler technique. The training would be highly feasible and suitable for implementing in the clinical setting. Our model of pharmacist-led training should be considered as an effective solution for managing COPD patients and better utilization of health care human resources, especially in a developing country like Vietnam. Although the role of pharmacists in the management of COPD has expanded recently,8,10,11 there are only a few studies that specifically focus on the role of pharmacists in counseling and educating COPD patients in developing countries. Vietnam is a typical example of a developing country where health care resources are heavily constrained, and the role of pharmacists is limited mainly to dispensing in pharmacies and hospitals. However, in Vietnam, there is a national program for the management of asthma and COPD in operation for ~7 years with very limited involvement of pharmacists.12 With increasing number of COPD patients, individualized counseling for patients is a challenge to the limited number of physicians. The potential contribution of pharmacists to the COPD management program to produce better patient outcome is yet to be explored. Since the correct inhaler technique is crucial to delivering positive outcomes in COPD and asthma, the most logical approach would be to assess the role of pharmacists’ intervention to improving the inhaler technique among patients. Therefore, the objective of our study was to evaluate the impact of pharmacists’ training on the improvement of the inhaler technique for COPD patients enrolled in the national program for management of asthma and COPD in Vietnam. Besides Vietnam, the results of the current study would be applicable in other countries/jurisdictions in informing clinical pharmacy practice. The study was conducted in Bach Mai Hospital in Hanoi where a national program for management of COPD has been running for 7 years. All patients recorded in the list of COPD outpatients attending the COPD program from January to December 2016 were invited to participate in the study during their monthly medical consultation. To be eligible, the patients needed to satisfy the study inclusion criteria that include the following: had a diagnosis of COPD by the physician, attended the COPD program at least once per month and had at least one inhaler medication including metered-dose inhaler (MDI) and/or Turbuhaler® (AstraZeneca plc, London, UK) prescribed for COPD. The exclusion criteria included patients with serious visual, hearing and communication problems; deficit of mental function; at end stage of serious diseases such as cancer; attending other programs related to pulmonary diseases and unable or unwilling to provide written informed consent. All eligible patients provided signed consent forms before enrolling in the study. The study was designed as a pre- and post-intervention study. The study was approved by the Scientific and Ethics Committee of Bach Mai Hospital and Human Research Ethics Committee of the University of Newcastle, Australia (number H-2015-0333). The checklist step of each inhaler device (MDI, and dry powder inhaler [DPI] Turbuhaler; Tables 1 and 2) was derived from COPD guidelines1,13 and published literature.14–16 In order to assess the use of the inhaler devices quantitatively, we assigned a score to each correct step. As all the steps were considered important to achieving optimal medication delivery, they were, therefore, allocated equal weighting and assigned a score of 1 point each. Hence, the maximum score that patients could attain was 8 points when they used the inhaler devices correctly in every step. Notes: T0, baseline; T1, after 1 month; T2, after 3 months; T3, after 6 months and T4, after 12 months. p: p-value of the McNemar’s test for comparison of percentage between time points T1, T2, T3, T4 and T0 (analyzed when appropriate). Participating patients were invited to meet the pharmacists in a counseling room in the hospital after their medical consultation and obtaining their medicines from the hospital pharmacy. During the pharmacist’s counseling, relevant personal data, such as age, gender, education level and history of smoking, were first collected from the patients. Other information including years suffering from COPD, years enrolled in the national program and the level of COPD by Global Initiative for Chronic Obstructive Lung Disease (GOLD) classification1 was obtained from patients’ medical records. Face-to-face training was then conducted, with one patient to one pharmacist. Patients were asked to demonstrate their inhaler technique on placebo inhaler devices (the same devices as prescribed by their physician) in front of the pharmacist. If the patient made any mistakes, the pharmacist would correct and explain why the missing step(s) were important. The pharmacist then demonstrated to the patient every inhaler step, both verbally and physically, by using the placebo inhalers. Patients were requested to perform the technique again until they could demonstrate all steps correctly (“teach back”). The training was applied every month in the first 3 months and then repeated at the 6th month and 12th month. If the patients made any mistake, one additional reminder label (Box 1) that included a summary of the steps was stuck onto their inhaler device(s). Pharmacists made sure that patients were able to read the label. Pharmacists would assess the inhaler technique by recording and scoring the correct step(s) before the training (T0) and then reassessing the patients’ inhaler technique after 1 month (T1), 3 months (T2), 6 months (T3) and 12 months (T4) from baseline evaluation. The three outcomes used to assess the impact of training were 1) percentage of patients having “correct technique,” which was achieved when patients performed all the steps correctly; 2) number of patients having improvement in each step and 3) score technique improvement. The relevant patient information and the inhaler technique scores were analyzed by using description statistics and expressed as percentages where appropriate. One-way analysis of variance, with post hoc test and paired-samples t-test were applied to identify the difference among mean of scores at the different time points. The McNemar’s test was used for determining the difference in dichotomous dependent variables between two groups in the pre–post intervention study. Statistical significance was set at p-value ≤0.05 (two tailed). All data were analyzed using SPSS version 22.0 (IBM Corporation, Armonk, NY, USA). 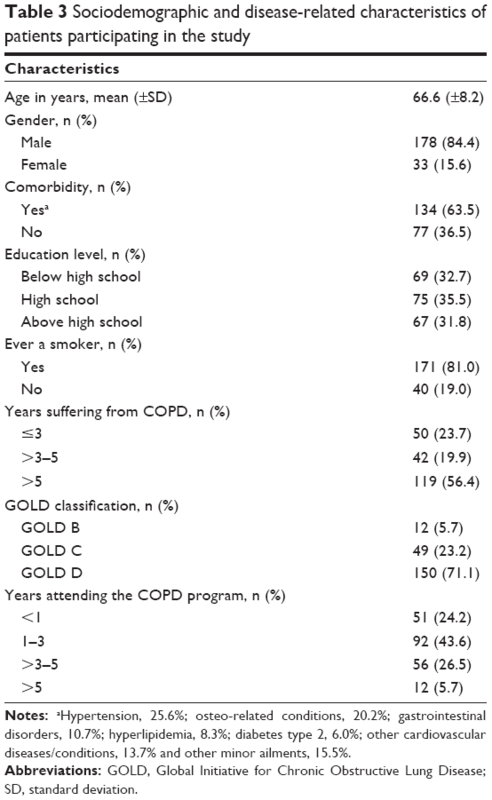 Most of the participating COPD patients were elderly subjects with a mean age of 66.6 years (±8.2 years; Table 3). As expected, there were more male patients due to the high rate of smoking in Vietnamese males (84.4%). Approximately 70% of patients had an education level of high school or below. In addition, the majority of participants had COPD for >3 years. More than 90% of patients were at GOLD C and GOLD D classifications, the most severe levels of the disease.1 Approximately 80% of patients had attended the program for >1 year. The number of participants at the various time points is detailed in Figure 1. Notes: aHypertension, 25.6%; osteo-related conditions, 20.2%; gastrointestinal disorders, 10.7%; hyperlipidemia, 8.3%; diabetes type 2, 6.0%; other cardiovascular diseases/conditions, 13.7% and other minor ailments, 15.5%. Abbreviations: GOLD, Global Initiative for Chronic Obstructive Lung Disease; SD, standard deviation. Figure 1 Flow diagram for the time of assessing technique and dropout rates. Before training (T0), the percentages of patients demonstrating the correct inhaler technique were 13.9% and 20.5% for MDI and Turbuhaler, respectively (Figure 2). The training took 6 minutes on average for the first counseling session and 3 minutes after the first time. After training with pharmacists (Figure 2), the percentage of patients performing the technique correctly increased from 13.9% and 20.5% (T0) to 56.8% and 61.9% (T3) for MDI and Turbuhaler, respectively. When the period between the training was longer (6 months from T3 to T4), the percentage of patients having the correct technique decreased from >61.9% to 48.7% with Turbuhaler (p=0.302). For MDI, after the 6-month period, the percentage of patients having the correct technique decreased significantly from 58.6% to 33.3% (p=0.002). 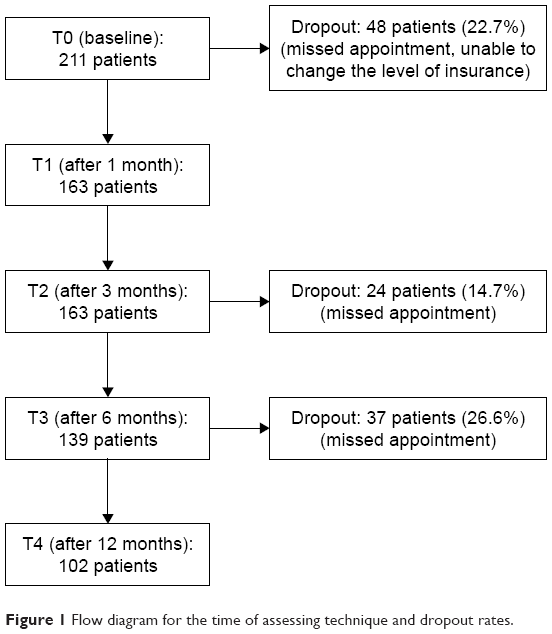 Figure 2 Comparison of the percentage of patients performing the correct inhaler technique over the study period. Notes: T0, baseline; T1, after 1 month; T2, after 3 months; T3, after 6 months and T4, after 12 months. p: p-value of the McNemar’s test determined the difference in the percentage of patients who performed the correct technique (all the correct steps) between time points T1, T2, T3, T4 and T0. Regarding the specific steps, as shown in Tables 1 and 2 (T0), no mistakes were observed for Step 1; however, mistakes were recorded for every other step thereafter. The most common mistake for both inhaler devices was Step 4 (breathe out), with <30% of patients remembering to perform this step. The second common mistake was Step 6 for both MDI and Turbuhaler. After training, the number of patients who performed each step correctly increased significantly. Evaluation of the mean inhaler technique scores with MDI across the five assessment time points showed mean scores of 6.09, 6.97, 7.49, 7.49 and 6.93 for T0 (baseline), T1 (after 1 month), T2 (after 3 months), T3 (after 6 months) and T4 (after 12 months), respectively (Figure 3). Overall, there was a significant difference in patients’ inhaler technique scores after training (p<0.001). In particular, significant increases were observed at 1, 3, 6 and 12 months after training in comparison to baseline values (T0). Results for the Turbuhaler technique (Figure 4) were similar to those of the MDI technique. However, significant increases in scores were only observed at 3 months (p=0.001) and 6 months (p<0.001) after training when compared to baseline values (T0). For both inhaler devices, there was a decrease in the mean technique score from the 6th month (T3) to the 12th month (T4). Figure 3 Comparison of the mean technique score for MDI across the study period. Notes: T0, baseline; T1, after 1 month; T2, after 3 months; T3, after 6 months and T4, after 12 months. p: p-value of ANOVA and post hoc tests in comparison of the score between after the training (T1, T2, T3, T4) and before training (T0). Abbreviations: ANOVA, analysis of variance; MDI, metered-dose inhaler; SD, standard deviation. Figure 4 Comparison of the mean technique score for Turbuhaler® across the study period. Notes: T0, baseline; T1, after 1 month; T2, after 3 months; T3, after 6 months and T4, after 12 months. p: p-value of ANOVA and post hoc tests in comparison of the score between T1, T2, T3, T4 and T0. Abbreviations: ANOVA, analysis of variance; SD, standard deviation. 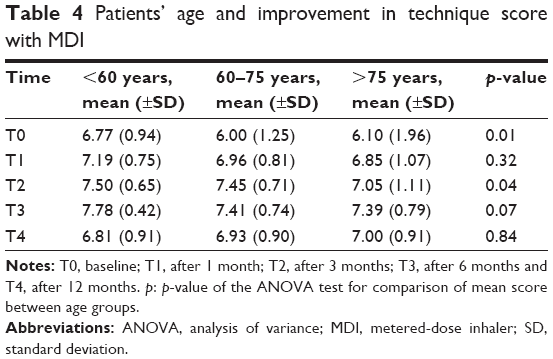 Baseline values (T0; Table 4) showed a significant difference in technique scores among different age groups of participants (p=0.01), with younger patients having higher overall scores. However, the scores of all patients increased significantly after attending the training program and no significant differences were observed after the T2 assessment time point. Before the training, years of suffering from COPD and attendance in the national program were two factors that influenced the inhaler technique score (T0; Tables 5 and 6). More specifically, patients who participated in the program for longer or those that have suffered from COPD for a longer duration had higher baseline scores (p<0.05). However, the technique scores improved in all patient subgroups after the training, with no significant difference between the scores in these groups (p>0.05; T1–4; Tables 5 and 6). Notes: T0, baseline; T1, after 1 month; T2, after 3 months; T3, after 6 months and T4, after 12 months. p: p-value of the ANOVA test for comparison of mean score between age groups. Notes: T0, baseline; T1, after 1 month; T2, after 3 months; T3, after 6 months and T4, after 12 months. 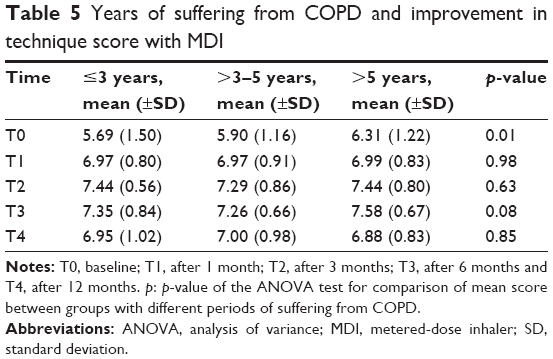 p: p-value of the ANOVA test for comparison of mean score between groups with different periods of suffering from COPD. Notes: T0, baseline; T1, after 1 month; T2, after 3 months; T3, after 6 months and T4, after 12 months. p: p-value of the ANOVA test for comparison of mean score between groups with different periods of attending the program. Quantitative scoring of the inhaler technique was used in this study to facilitate simpler and more consistent evaluation. Health workers and caregivers just need to check the steps by scoring 1 point for each correct step and 0 for each incorrect step. Even family members of patients can use the checklist to score and report to health professionals. The scoring inhaler technique has also been utilized in previous studies.9,16,24,25 These studies allocated points to each inhaler technique step based on its level of significance in the overall process.15,28 Hence, it is critical to define which step (classified as critical step) would lead to little or no medication reaching the lungs if performed incorrectly.15,17 However, there is no clear agreement on the importance of each step as shown by the many checklists used in the assessment of the inhaler technique in published studies and clinical practice. A review by Basheti et al28 compared 24 checklists for the appropriate use of DPI Turbuhaler and found a substantial variation in the number of steps listed (ranging from 3 to 14 steps), as well as different critical steps identified in 10 of the checklists. Besides likely to create inconsistency between evaluators, focusing on critical steps may also lead assessors to ignore “less important” steps that may significantly affect drug delivery.17 Therefore, equal scoring of the inhalation steps used in our study appears to be a more suitable method for its simplicity and consistency when applied in clinical practice. The training applied in our present study was specially chosen to cater for COPD patients who are generally older and have additional comorbidities. The first method was face-to-face training of COPD patients by the pharmacists. “One pharmacist-to-one patient” training has been described as the best method to teach patients how to use inhalers properly.16,30 Second, “Teach-back” has also been shown to be an effective method for COPD patients by evaluating their understanding of the inhalation technique as they practiced using the inhaler in front of pharmacists.30 Third, our study is the first to apply the use of “inhaler reminder labels” for COPD patients. This method has previously been applied successfully in other studies of asthma patients using DPI Turbuhaler and Diskus.16 The label helped patients to better remember the correct technique.27 This was considered as a better method than providing patients with other take-home materials such as video instructions or medication leaflets containing excessive information.16,27 However, unlike previous studies, we used labels with a larger font size and patients were asked to confirm that they could read the label clearly. A larger font size would increase noticeability and readability and has been shown to be effective in improving compliance.31,32 Hence, our reminder label with a larger font size may also contribute positively to better inhaler technique in combination with direct training. Repeated training is crucial to maintaining proper inhaler technique and is recommended by respiratory experts and guidelines.1 However, there is no consensus of exact period of time for regular checks and training for assuring proper maintenance. It has been suggested that checks should be performed every 1–3 months, or every time a patient visit their doctor or pharmacy.24 In our study, we initially reviewed the patients’ technique intensively every month for the first 3 months and then at 6 months and 12 months. Intensive training at the beginning of inhaler use is very important, as it is difficult for COPD patients to remember all the steps at the first meeting.33 Furthermore, forgetfulness commonly occurs especially in older patients.34 Thus, it is necessary to repeat the checking and training process for the inhaler technique along with other outcomes of COPD. Our findings suggest that complete training should be repeated every 3 months after the first intensive period, as our study showed an increased number of patients making mistakes and a decrease in technique scores for both inhaler devices 6 months after intensive training (ie, T3 to T4 of our study time points). Therefore, this suggested that a 3-month period would be the optimal time for retraining after the initial intensive training. Our study also showed that the application of these pharmacists’ interventions for COPD patients is feasible as part of pharmacists’ everyday duties. The average time for the first meeting was ~6 minutes, which included time for checking inhaler technique, pointing out incorrect steps, asking the patient to demonstrate inhaler use again and sticking a technique label to the device if necessary. The duration of the second and third visits gradually decreased to ~3 minutes. The time taken in our study is similar to the time of intervention recorded in another study.16 Basheti et al16 reported a median time taken for inhaler technique intervention of 5 minutes (±2 minutes) for the first meeting and 2 minutes and 1 minute for the second and third visits, respectively. This is the first study that has evaluated the impact of pharmacist-led training to improving the proper use of inhaler devices for COPD patients in a developing country. We have developed a comprehensive method that is suitable for training a diversity of population groups, including older patients, in order to optimize effectiveness of inhaler devices. We have also applied an unbiased and simple scoring method for assessing outcomes, as well as identified an appropriate period of time for retraining patients to maintain the correct inhaler technique. There are several limitations in our study. First, the study only included patients enrolled in the national program, which may overestimate the ability of the general COPD patients who would have less support than those in the program. Second, the study has not yet correlated the improvement in the inhaler technique with clinical outcomes. Clinical improvement depends on many factors such as drug selection, patient compliance and control of other risk factors including the environment and nutrition. Nevertheless, proper inhaler use has been shown to be closely related to improving clinical outcomes of COPD patients.5 Third, the relative high dropout rate (~50%) may also affect the robustness of our study results. However, we had also analyzed the data only for the patients who were assessed at every assessment point, and the results did not differ. Furthermore, we also compared the demographic and other characteristics between dropout and non-dropout groups and again found no significant difference except in age. Although the dropout group was slightly younger, the mean ages of both groups were similar to the total group. An inference from these additional analyses would be that the high dropout rate did not affect our final results. Our study showed that a pharmacist-led comprehensive inhaler technique intervention program using an unbiased and simple scoring system can significantly improve the inhaler techniques in COPD patients. We also identified an optimal time period between training and retraining for maintaining the correct inhaler technique. Our model of pharmacist-led training should be considered as an effective solution for managing COPD patients and better utilization of human resources in health care, especially in a developing country like Vietnam. The authors would like to thank patients for participating in the study and pharmacists of the Department of Pharmacy, Bach Mai Hospital, for training patients, especially Mrs Nguyen Hoai Thu, Miss Do Thi Thu Hien and Miss Kim Huyen Trang. The authors also wish to thank the Board of Directors of Bach Mai Hospital and members of Department of Clinical Pharmacy, Hanoi University of Pharmacy, for supporting the study. All authors contributed to tool development and study design, data analysis, drafting and revising the manuscript, gave final approval of the manuscript version to be published, and agreed to be accountable for all aspects of the work. Global initiative for Chronic Obstructive Lung Disease (GOLD). Global Strategy for the Diagnosis Management and Prevention of Chronic Obstructive Pulmonary Disease; 2017 [updated 2017]. Available from: http://goldcopd.org/gold-2017-global-strategy-diagnosis-management-prevention-copd/. Accessed March 30, 2017. Ait-Khaled N, Enarson D, Bousquet J. Chronic respiratory diseases in developing countries: the burden and strategies for prevention and management. Bull World Health Organ. 2001;79(10):971–979. Ministry of Health. National Program for Management of Chronic Respiratory Diseases in Vietnam; 2015. Available from: http://benhphoitacnghen.vn/hoi-nghi-khoa-hoc-va-le-mit-tinh-huong-ung-ngay-hen-toan-cau-2018.html. Accessed May 23, 2018. Vietnamese. Le TTL. The actuality of chronic obstructive pulmonary disease in Vietnam. J Fr Vietnam Assoc Pulmonol. 2011;2(04):46–48. Melani AS, Bonavia M, Cilenti V, et al. Inhaler mishandling remains common in real life and is associated with reduced disease control. Respir Med. 2011;105(6):930–938. Sriram KB, Percival M. Suboptimal inhaler medication adherence and incorrect technique are common among chronic obstructive pulmonary disease patients. Chron Respir Dis. 2016;13(1):13–22. Sanchis J, Gich I, Pedersen S; Aerosol Drug Management Improvement Team (ADMIT). Systematic review of errors in inhaler use: has patient technique improved over time? Chest. 2016;150(2):394–406. Axtell S, Haines S, Fairclough J. Effectiveness of various methods of teaching proper inhaler technique. J Pharm Pract. 2017;30(2):195–201. Tommelein E, Mehuys E, Van Hees T, et al. Effectiveness of pharmaceutical care for patients with chronic obstructive pulmonary disease (PHARMACOP): a randomized controlled trial. Br J Clin Pharmacol. 2014;77(5):756–766. Zhong H, Ni XJ, Cui M, Liu XY. Evaluation of pharmacist care for patients with chronic obstructive pulmonary disease: a systematic review and meta-analysis. Int J Clin Pharm. 2014;36(6):1230–1240. Hammerlein A, Muller U, Schulz M. Pharmacist-led intervention study to improve inhalation technique in asthma and COPD patients. J Eval Clin Pract. 2011;17(1):61–70. Vietnam Ministry of Health, Health Partnership Group; Hanoi: Medical Publishing House; 2015. Joint Annual Health Review 2014: Strengthening prevention and control of non-communicable Disease. Available from: http://www.jahr.org.vn/downloads/JAHR2014/JAHR%202014_EN_full.pdf. Accessed May 23, 2018. Ministry of Health. Vietnamese Guideline for Diagnosis and Treatment of Chronic Obstructive Pulmonary Disease. 2015. (No 2866/QĐ-BYT). Hanoi: Medical Publishing House; 2015. Sanchis J, Corrigan C, Levy ML, Viejo JL; ADMIT Group. Inhaler devices – from theory to practice. Respir Med. 2013;107(4):495–502. Batterink J, Dahri K, Aulakh A, Rempel C. Evaluation of the use of inhaled medications by hospital inpatients with chronic obstructive pulmonary disease. Can J Hosp Pharm. 2012;65(2):111–118. Basheti IA, Armour CL, Bosnic-Anticevich SZ, Reddel HK. Evaluation of a novel educational strategy, including inhaler-based reminder labels, to improve asthma inhaler technique. Patient Educ Couns. 2008;72(1):26–33. Molimard M, Raherison C, Lignot S, Depont F, Abouelfath A, Moore N. Assessment of handling of inhaler devices in real life: an observational study in 3811 patients in primary care. J Aerosol Med. 2003;16(3):249–254. Dudvarski Ilic A, Zugic V, Zvezdin B, et al. Influence of inhaler technique on asthma and COPD control: a multicenter experience. Int J Chron Obstruct Pulmon Dis. 2016;11:2509–2517. Pothirat C, Chaiwong W, Phetsuk N, Pisalthanapuna S, Chetsadaphan N, Choomuang W. Evaluating inhaler use technique in COPD patients. Int J Chron Obstruct Pulmon Dis. 2015;10:1291–1298. Arora P, Kumar L, Vohra V, et al. Evaluating the technique of using inhalation device in COPD and bronchial asthma patients. Respir Med. 2014;108(7):992–998. Lavorini F, Magnan A, Dubus JC, et al. Effect of incorrect use of dry powder inhalers on management of patients with asthma and COPD. Respir Med. 2008;102(4):593–604. Quinet P, Young CA, Heritier F. The use of dry powder inhaler devices by elderly patients suffering from chronic obstructive pulmonary disease. Ann Phys Rehabil Med. 2010;53(2):69–76. Khassawneh BY, Al-Ali MK, Alzoubi KH, et al. Handling of inhaler devices in actual pulmonary practice: metered-dose inhaler versus dry powder inhalers. Respir Care. 2008;53(3):324–328. Thomas RP, Rani NV, Kannan G, Thennarasu P, Mohammed S. Impact of pharmacist-led continuous education on the knowledge of inhalation technique in asthma and COPD patients. Int J Med Health Sci. 2015;4(1):7. Goris S, Tasci S, Elmali F. The effects of training on inhaler technique and quality of life in patients with COPD. J Aerosol Med Pulm Drug Deliv. 2013;26(6):336–344. Nguyen NT, Nguyen TTN. Evaluation of the metered-dose inhaler technique in the patients with asthma and COPD. Med J Hochiminh City. 2003;7(1):103–109. Basheti IA, Obeidat NM, Reddel HK. Effect of novel inhaler technique reminder labels on the retention of inhaler technique skills in asthma: a single-blind randomized controlled trial. NPJ Prim Care Respir Med. 2017;27(1):9. Basheti IA, Bosnic-Anticevich SZ, Armour CL, Reddel HK. Checklists for powder inhaler technique: a review and recommendations. Respir Care. 2014;59(7):1140–1154. Vo TH, Bedouch P, Nguyen TH, et al. Pharmacy education in Vietnam. Am J Pharm Educ. 2013;77(6):114. Press VG, Arora VM, Shah LM, et al. Teaching the use of respiratory inhalers to hospitalized patients with asthma or COPD: a randomized trial. J Gen Intern Med. 2012;27(10):1317–1325. Hellier E, Edworthy J, Derbyshire N, Costello A. Considering the impact of medicine label design characteristics on patient safety. Ergonomics. 2006;49(5–6):617–630. Liu F, Abdul-Hussain S, Mahboob S, Rai V, Kostrzewski A. How useful are medication patient information leaflets to older adults? A content, readability and layout analysis. Int J Clin Pharm. 2014;36(4):827–834. Takaku Y, Kurashima K, Ohta C, et al. How many instructions are required to correct inhalation errors in patients with asthma and chronic obstructive pulmonary disease? Respir Med. 2017;123:110–115. Wallin M, Tagami T, Chen L, Yang M, Chan HK. Pulmonary drug delivery to older people. Adv Drug Deliv Rev. Epub 2017 Nov 29.